Trade war. Sounds scary. And it is. 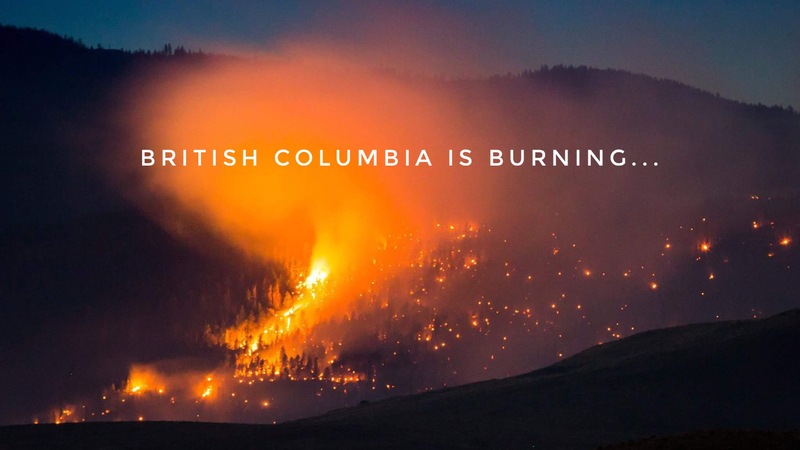 As a Canadian dairy farmer, my farm and family is directly in the crosshairs in this fight. That cold sick feeling in the pit of our stomachs has returned yet again as we wait to hear what the future holds for us. Will we survive this latest attack on our livelihood? Will scenes like this soon only be a memory in rural Canada? President Trump’s latest tirade against our country’s dairy supply management system and his demands to dismantle said system are frankly quite frightening. 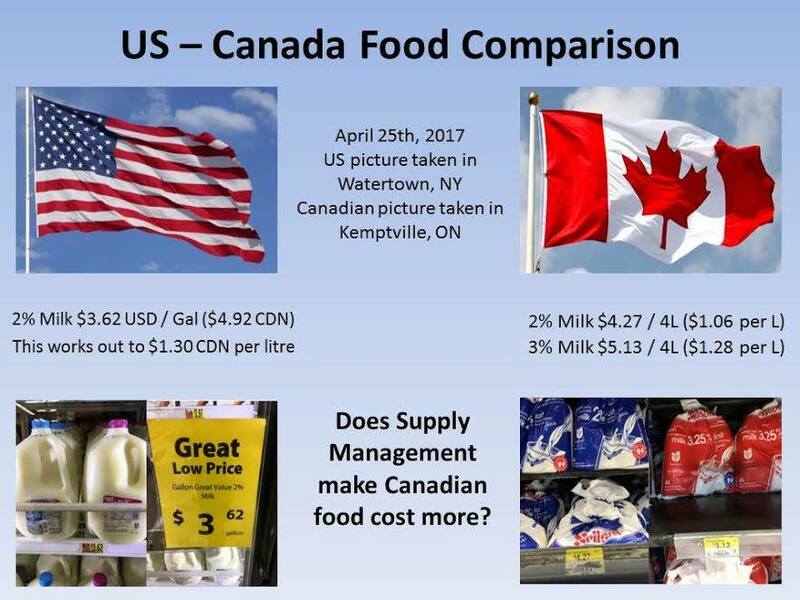 But what is most frustrating is the lack of background or real facts in his claims of unfair trade practices in dairy between the US in Canada. Supply management means that our Canadian dairy farms produce enough milk for Canadian consumers. In order to keep this balance between demand and supply, our government has trade barriers in place in the form of tariffs on dairy imports. Foreign countries are able to import milk to Canada, but they will be charged a high tariff (up to 300%). This cost is often prohibitive to imports and so Canadian processors usually rely on domestic dairy supply. But… Canada does allow some tariff free imports – about 10%. 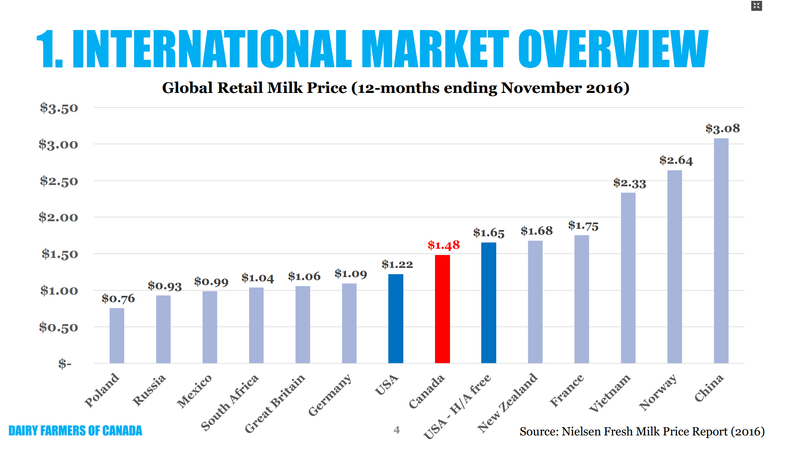 This percentage has been increasing in recent years; CETA and the new TPP have whittled away a sizeable chunk of our dairy market. But get this: this 10% is more than double the amount that the USA allows. Say what??? Yes, you read that correctly. The US caps tariff free imports at about 2.75%. So, the US ALSO protects their dairy industry. Ironic, huh? Yet, President Trump has attacked our system. You see, American dairy farmers are in dire straits. They produce much much more milk than is needed in the States and export a rather significant percentage to other countries, Canada included. The global dairy market is saturated, there’s simply too much milk. This has driven the price paid to American farmers below the cost of production, pushing many farms out of business. It’s understandable then that Trump would look for ways to alleviate these problems. But expecting entirely free dairy trade with Canada to fix this problem is ludicrous. With a population 1/10th the size of the States’, our market is too small to make a very significant dent in their current surplus. Wisconsin alone produces more milk than all Canadian farms combined. The US needs to manage their own issues with over supply rather than expecting us to fix their problems. Our own farmers do a fine job of supplying our citizens with dairy products, thank you very much. And if the border were opened, what would be the cost? Our current system ensures a fair price paid to farmers that covers the cost of production. American dairy farms are already producing milk at a loss, and Canadian farms would soon follow suit. Small farms unable to compete with the economies of scale present on mega dairies with tens of thousands of cows would be the first to go. Farms like ours. Family farms. Our rural fabric would be forever changed. Is that what Canadians want? If you want the dairy products you enjoy to be produced on Canadian farms, under the strictest animal welfare, milk quality and food safety standards in the world, it’s time to speak up. Let your elected officials know that your Canadian dairy products and dairy farmers are important to you. Reach out to your MP. Send an email to the Prime Minister’s office. Do anything you can to encourage our government to stand firm, to not give in to Trump’s bullying tactics. If they don’t, this photo may one day be one of the only reminders of the farms that used to dot our countryside. Let’s work together to make sure that doesn’t happen. 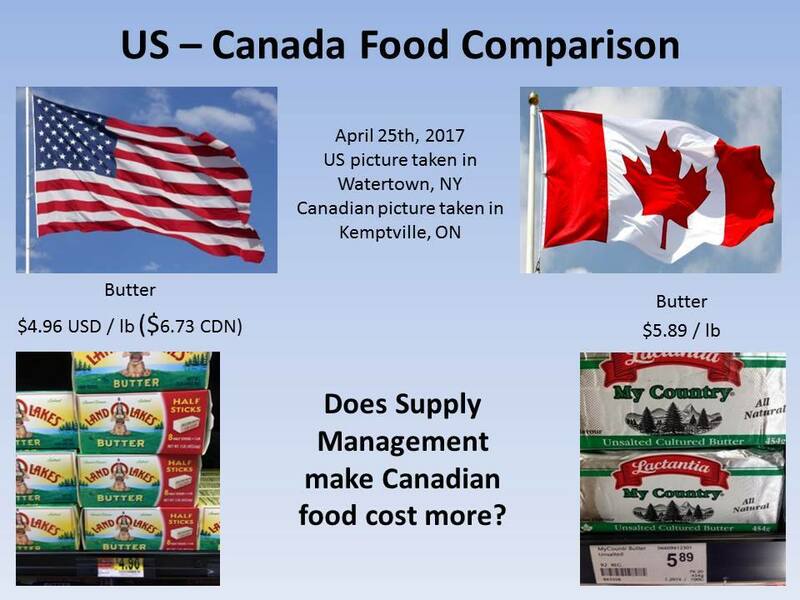 Supply Management: Good for farmers, good for consumers, good for Canada. Hands off, Bernier! Okay friends, we’re coming down to the wire here in the Conservative leadership race. With all of the uproar in the last week with President Trump taking aim at our Canadian dairy industry, we can’t forget that we also have domestic challenges facing our industry. Just this morning, Canadian businessman and Conservative leadership candidate Kevin O’ Leary, one of the polling front-runners in the leadership race, pulled his name from the race and threw his support behind Maxime Bernier. As you know from our previous posts, Maxime Bernier has pledged to end supply management if he is elected leader of the Conservative Party of Canada, and Mr. O’ Leary had admitted that he would use supply management as a bargaining tool in future trade negotiations. Both he and Mr. O’ Leary are leading in the polls, so as you can understand, this bolstering of Bernier’s campaign is rather unsettling. Supply management keeps Canadian dairy, poultry and egg farms vibrant, viable, and an integral part of our national fabric, from both a social and economic perspective. Without supply management and our border tarriffs, our family farms would have a very hard time competing with the glut of excess milk currently flooding the world dairy market. We know that our system that ensures a fair return for farmers is the envy of dairy farmers around the world, and we personally have received many messages from farmers south of the Canadian – US border who long for a system like ours that would allow their farms to remain viable in this turbulent time for the dairy market. So the benefits for farmers are obvious, but what about for our consumers? Mr. Bernier alleges that if supply management were scrapped, consumers would pay much less for their dairy; he’s even claimed that Canadian consumers pay twice the amount they should pay for their dairy products. Unfortunately, Mr. Bernier does not have his facts straight. Check out the photos I’ve posted below. 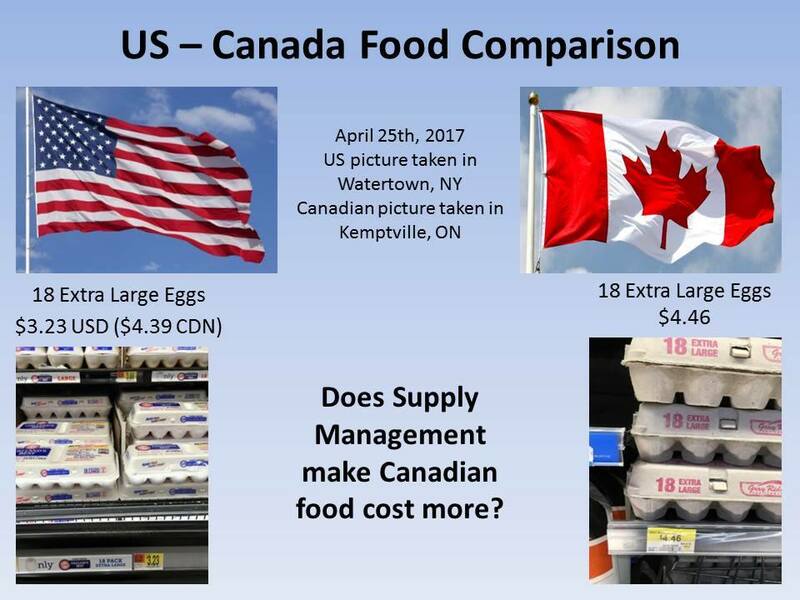 Both research from an accredited research firm and very current anecdotal evidence from a fellow dairy farmer doing her own research prove that Canadians pay a very competitive price for their eggs and dairy. 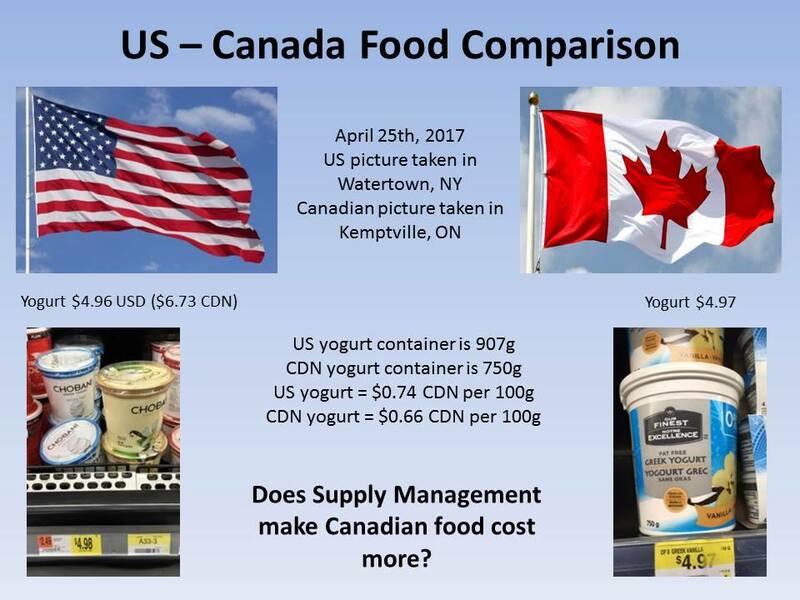 In fact, if we compare apples to apples, Canadian pay LESS for dairy compared to the same dairy products in the US (all Canadian milk is produced without the use of artificial growth hormones). Now, Mr. Bernier, either you’ve been misinformed, or you’re deliberately trying to garner support from unsuspecting Canadians by quoting “alternative facts”. Judging by the number of times dairy farmers and industry representatives have presented the correct information to you, I’m leaning towards the latter assumption. That doesn’t say much for your integrity, and, in my opinion, throws your entire campaign and character into question. Definitely not the type of individual I want to see at the helm of the Conservative party or – if the Conservatives are re-elected in 2019 – leading our country. Friends, let’s get the word out! We’re not only facing threats to our family farms from south of the border, we have a very real challenge right here at home too. If you want to enjoy the stable, competitive dairy prices that are the current reality, produced right here in Canada according to the highest safety, quality and animal welfare standards in the world — all the while benefitting family farms and rural economies across our country, speak up! Canadians need to understand that a vote for Bernier is a vote against food sovereignty, against family farms, and against the very fabric of our rural communities. Your help in sharing this message is appreciated.